Cam station, the intermediate stop on the line, was a smaller affair than that at Coaley Junction or Dursley. It was a red brick building with no canopy and accommodation consisted of a waiting room, a booking hall and a booking office. It had a short single platform on which stood the station building and a small wooden goods shed. At the western end of the platform was a level crossing worked by the station staff and on the other side of the crossing stood the Railway Inn, still in existence today. The station was dominated by the buildings of the Hunt & Winterbotham cloth mill which was served by a siding. The brick nature of the building and the lack of shelter for passengers can clearly be seen in this view. The wooden goods shed stands to the left of the main station building. By this date the station was worked by one man. The small hut on the left of this view was built in 1938 and housed the ground frame controlling the signal and the crossing gate. Also visible is the simple entrance by which passengers made their way directly on to the platform. This view along the track towards Coaley Junction shows the level crossing gate across Station Road. On the other side of the crossing, to the left and just out of view stands the Railway Inn which is still operating in 2003. The 4:15pm from Coaley Junction departs towards Dursley. 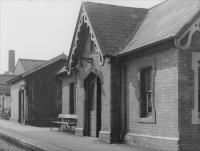 The distinctive style of the Dursley and Midland Junction Railway building is clearly seen in this view at Cam station. Engine 46526 approaches Cam station with the 9:55am train from Dursley. Dominating the background is the mill complex of Hunt & Winterbotham. Engine 46526 crosses the road near Cam Station with the 9.55am train from Dursley. Great Western Railway pannier tank locomotive 7435 passes Cam propelling its train towards Dursley.